Lilly the cat senses her owner is having an epileptic seizure. As reported by the Daily Mail, Lilly can detect the seizures Nathan Cooper suffers on a weekly basis before they happen, and alert the 19-year-old college student’s parents. Tracey Cooper, Nathan's mother, said that 14-month old Lilly who is usually "a quiet little thing" starts meowing loudly and running up and down the stairs when Nathan is having a seizure. The family can then make sure that Nathan doesn't hurt himself by falling. "After one fit, he stopped breathing and Lilly started licking his mouth and somehow it kick-started his breathing. Now she won’t leave his side." said Mrs. Cooper. Lilly beat out 6,000 cats in the U.K. to win the Top Cat category in Drontal's My Pet Superstar competition reported the Press Association. Some cats are sent here for a specific reason. This is one of them. That is so very pawsome! I had heard that some cats (and dogs) are sensitive in this way. It's quite amazing! Amazing! 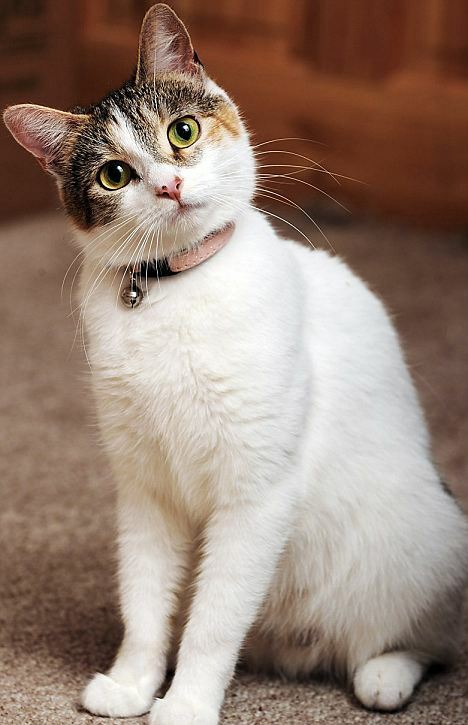 We've known about seizure detecting dogs but this is the first we've heard about a kitty. Very pawsome! what a wonderful story! who says cats don't save lives!